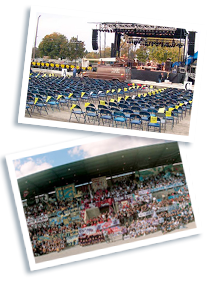 Grandstand seats 3200, in an Outdoor covered facility. Room for portable floor seating and staging. Infield areas are idea for year round outdoor events. Viewing tower with 360 view of Track and Infield Facilities for vendors, concessions and beer tents. Camping on site available. Call for a complete quote on your event needs.